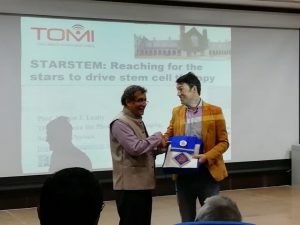 STARSTEM Coordinator Prof Martin Leahy of the Tissue Optics and Microcirculation Imaging (TOMI) Lab at the National University of Ireland Galway was an invited lecturer at the Indian Institute of Science Education And Research Kolkata, and at the Cochin University of Science & Technology (CUSAT). Martin’s talk was entitled “Reaching for the stars to drive stem cell therapy”. The two lectures took place in January 2019 in Mohanpur, West Bengal and in Kuttanad, Alleppey, India, respectively. More than 170 members of the scientific research community were in attendance. Learn more about STARSTEM here. Follow the project on Twitter, Facebook and on LinkedIn. STARSTEM has received funding from the European Union’s Horizon 2020 research and innovation programme under grant agreement No 761214. The material presented and views expressed here are the responsibility of the author(s) only. The EU Commission takes no responsibility for any use made of the information set out.